“Ploop ploop ploop” is the unique sound made by pouring out a bottle filled with lake mud and water. During New Voices Are Rising students’ and Rose Foundation staff’s recent cleanup of Oakland’s Lake Merritt, we pulled out several bottles and a number of odd bits of trash from the lake’s brackish water. Using pool cleaner nets, we gathered a candle in a glass container, almost caught a one-dollar bill, and removed a large amount of unidentifiable plastic. “Runoff brings trash into the lake and then tides bring the trash ultimately out into the Bay,” said Katie Noonan of the Lake Merritt Institute. Our New Voices students are working with Katie on a project to measure water quality where storm drains run off into the lake. pool nets make the perfect tool for scooping trash out of the water. 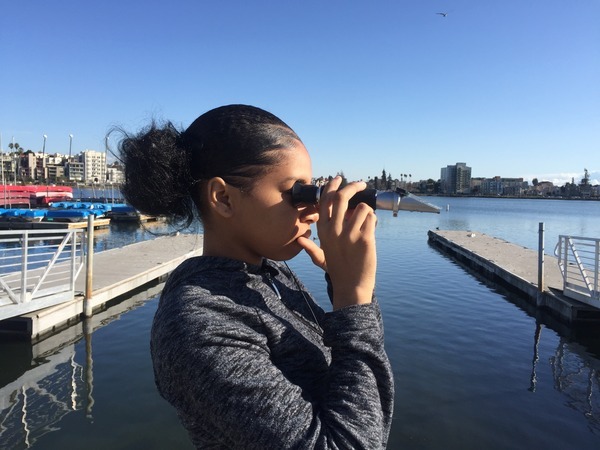 Measuring Lake Merritt’s water is a first step to understanding how one day Oakland could restore the lake for recreational use and for the benefit of local wildlife. Lake Merritt, once a saltwater wetland, became a lake only after developers drastically changed the landscape. Trash and human and animal waste continue to degrade water quality in the lake and where the lake exits into the bay. Many storm drains flow directly into the lake, and occasional sewer pipe leaks, frequent littering, and use of the lake as a bathroom also damage the lake’s water quality. Judging water doesn’t mean swirling lake muck around in a wine glass, and thankfully doesn’t require noting its taste profile. However, it does often involve profiling its smell in addition to a gauntlet of scientific measures. Katie and New Voices students sampled water from both the top and the bottom of the lake. They also measured turbidity, or clearness, as well as dissolved oxygen and salinity. As a saltwater lake, scores of organisms will die if either oxygen or salinity levels drop. The Lake Merrit Institute will deliver our future test samples to the Environmental Protection Agency where their labs will be able to test for the presence of microorganisms found in human and animal intestines to establish how much sewage enters the lake. New Voices student Talyah measures the lake’s salinity with a refractometer. The device measures how salt dissolved in a water sample changes light’s path through the sample. The measurements our students took showed signs of a healthy lake. The water was clear to the bottom of the measurement site and tests revealed high levels of oxygen at both the surface and the bottom of the lake. However, this one testing day is not enough to close the case on Lake Merritt’s water. Our students will have to test the water at different sites around the lake regularly to see how the lake changes over time. Rains can wash high volumes of trash into the water, while leaks in old sewer pipes can greatly disrupt the aquatic environment. Stay tuned for updates about the lake as our students continue to take measurements with the help of the Lake Merritt Institute. This entry was posted in none and tagged New Voices Are Rising.